We know our Flowers Lovers love a great look to send for birthdays so we’re pleased to present our newest birthday bouquet of fresh-cut flowers! 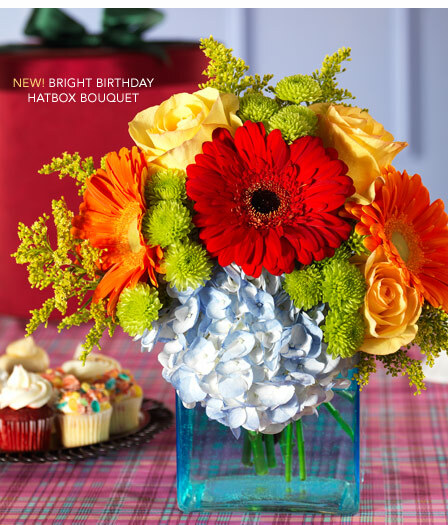 Introduced in our Mother’s Day catalog, the Bright Birthday Hatbox Bouquet has quickly become a favorite. With its bold color scheme and perky flowers it gets lots of oohs and aahs upon arrival. Plus it arrives in our sophisticated satin hatbox which gives it that little extra something special. 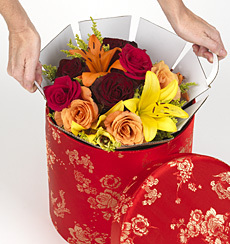 If you’ve never purchased a bouquet from our Flowers in a Hatbox collection you’re missing out. Each bouquet arrives “artfully arranged in a contemporary glass vase” so all your recipient has to do is remove the packaging and add water. It’s very easy and oh-so pretty. Here’s an example of how the bouquet arrives.